It’s no secret that some lawyers see Issue 1 as a threat to their lucrative business practices. When lawyers get mad, what do they do? They sue. So it should be no surprise that the legal lobby is resorting to a lawsuit to stop Issue 1. Retired Pulaski County Circuit Court Judge Marion Humphrey filed suit to stop the counting, canvassing, and certification of votes for Issue 1. His claim is that the various provisions of Issue 1 relate to four different subjects, thus violating state constitutional provisions that electors must vote on each amendment separately. Humphrey argues that the sections must be germane to one another, and that Issue 1’s sections are not. The general subject of amendment 89 is economic development and debt obligations. Each relevant section of amendment 89 speaks to a form of that general subject. Therefore, each relevant section relates to the general subject of the amendment. Further, each relevant section is reasonably germane to each other. This objection seems to be that the Legislature was without power to submit two questions in one amendment. In the first section of this amendment, it is provided that prosecuting attorneys may file [an] information or indictments may be had by grand juries, to charge one with crime. It also provides in §2 for the directing of the General Assembly to determine by law the amount, method and payment of salaries of prosecuting attorneys. We perceive no objection to this manner or method of amending the Constitution, as they both relate to the prosecuting attorney. We are, therefore, of the opinion that appellant is wrong in this contention. Issue 1 involves the general subject of limiting legal fees and awards and allowing the legislature to have some say in setting rules of practice and procedure (which relate directly to the issue of fees and awards). The sections are not on exactly the same topics, but they all relate to the same issue – how the courts operate in Arkansas. Each section speaks to a form of that general subject. They are certainly reasonably germane to each other. Humphrey claims that there is no “common legal chord” uniting Issue 1’s sections, so they violate the state constitution. 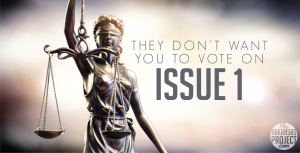 The Arkansas Constitution merely mandates that amendments “shall be so submitted as to enable the electors to vote on each amendment separately.” Since this amendment is one amendment that relates to the operation of the judiciary, I find it difficult to see how it violates this constitutional provision. It’s not like it is, say, Amendment 9 in Florida, which is a ballot measure containing two constitutional amendments – one to ban offshore drilling and one to ban indoor vaping. That type of ballot measure – where two completely unrelated amendments are shoehorned into a single ballot question – would clearly violate the Arkansas constitution. But, just as clearly, that is not what is happening with Issue 1. What is even stranger, Humphrey argues that approval of Issue 1 would “violate” various sections of the state constitution. This hamfisted argument ignores that an amendment to the constitution amends the constitution. If a document is amended, these amendments do not violate the document — because they are now part of the document! It is absurd to argue that approval of a constitutional amendment violates the constitution because once the amendment is approved, it is a part of the constitution – and yet here we are. Continuing with the strange pleadings, Humphrey also claims that Issue 1 would violate the state’s separation of powers (a canard we have dealt with extensively on TAP) without “informing the electorate of its consequences.” I’m not sure why this is even in a judicial pleading. Issue 1 is before the voters. If the lawyers like Humphrey think that it would undermine the separation of powers (which, to reiterate, it won’t), anyone is free to make this argument. In fact, many people (most notable Justice Annabelle Imber Tuck) have been doing so. This is a question of politics, not law. I’ll be the first to admit that I am not a lawyer, so maybe I’m missing something that is obvious to those in the legal profession. As it appears to this layman, however, this is a quite literally frivolous attempt to deprive Arkansans of the right to vote on tort reform. (It’s frivolous because it ignores the accumulated case law that any competent lawyer would have looked at before signing the brief.) As we saw in the Courtney Goodson case, sometimes judges buy into ridiculous arguments that are not supported by the law. Maybe that will happen here. I’m sure that’s what Humphrey and his lawyer friends are hoping for.